Radon is a real and scary carcinogenic gas that is often found lurking within lower levels of homes across the world. This is a guest blog by AmeriSpec Home Inspection Service. You may own a commercial building right now that houses that very horror. But, you are in luck! 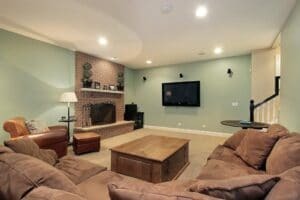 There is no better time to have your basement or home tested for the presence of radon than while you are having your lower level remodeled. A remodeling in your lower level involves a lot of ripping up the old to replace with the new. The exposed walls and other bits of a basement that otherwise have not seen the light of day for many years offers up the perfect chance to get a radon tester down there. Radon testing is a quick and easy investigation that yields results in relatively short order. Very small cracks, those that are so small they are not visible to the naked eye, are all that radon needs to infiltrate your home. Thus, just about any house in existence offers the welcome opportunity. The existence of radon’s concentration within your home is dependent upon the amount of uranium existing in the rock and soil that surrounds it. Driving force (pressure differential) “pushes” the radon into your home, via the leak points. Once you are aware of the presence of radon, you can indeed do something about it. Radon remediation can very easily be worked into most renovations. It is the perfect opportunity to have the work done. There are many different approaches you can take towards eliminating radon from the home. A family of ventilation techniques (sealing, sump pump ventilation, block wall ventilation) are the currently preferred means of radon reduction or removal across the world. Sealing involves caulking between joints and walls any openings. Utilizing epoxy sealants on openings or cracks in walls and floors will help seal up entry points. Sump pump ventilation involves sealing in and around the pump itself and utilizing an exhaust fan to send that air outside. Sump pumps being a number one culprit for the encouragement of radon entry, this is a good measure to take. Block wall ventilation is just that, installing something of a piping and fan network to send the radon that enters outside of the home. If radon is on your mind, it is time to have your home tested. If you already are in the process of a lower level renovation, testing and solutions can be applied to ensure a safer home. Risks for late in your life are minimized by dealing with issues like radon now. Amerispec Home Inspection Service provides radon testing in addition to their home inspection services.